Honoring My Compass: Day #40: Snowpocalypse! 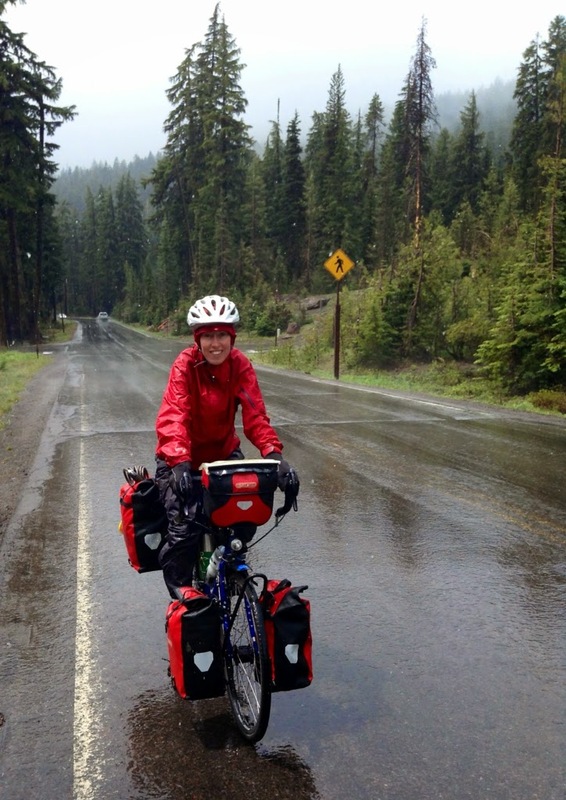 As we climbed up to the lake, we came across two cyclists heading in the opposite direction. The cyclists, a father and son duo, began their ride in Portland. They are hoping to make it to the Mexican border by July 7th. 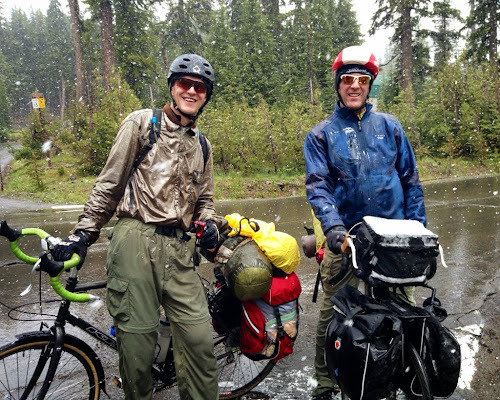 Alex and I let them know that the climbs would get tougher as they headed further south; the climb up to Crater Lake was peanuts compared to their climbs down the road. We wished the cyclists well and then continued along our way. The son and father duo. As we climbed higher, the conditions became more wintery. Near the top of the rim, it was a full-on white-out. Visibility was at an all-time minimum. Alex and I donned our most colorful apparel in hopes that vehicles would be able to spot us from as far away as possible. Although climbing through a white-out is one thing, descending through a white-out is another. Until we had cleared the white-out, Alex and I used our brakes quite a bit on the downhill, as we wanted to ensure that we could actually see where we were riding. 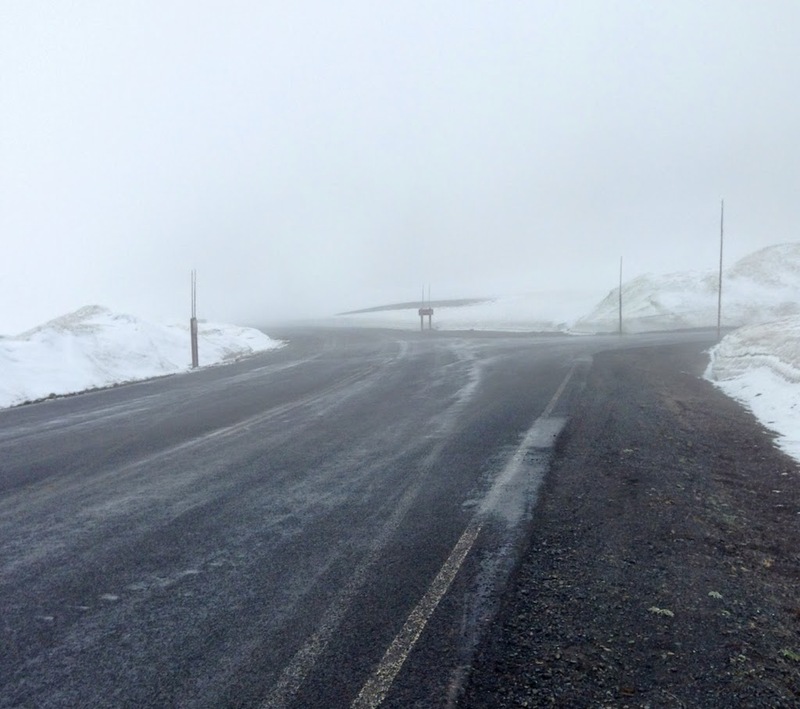 After a few minutes of descending, the visibility improved, though we were still being pounded with precipitation. Shortly after exiting the park, we reached the Cascade Summit. Although we hadn't heard from Randy in a few days (neither Alex nor I had cell reception at Crater Lake), we decided to leave Randy a note at the summit, in case he was still riding along the Sierra-Cascades route. 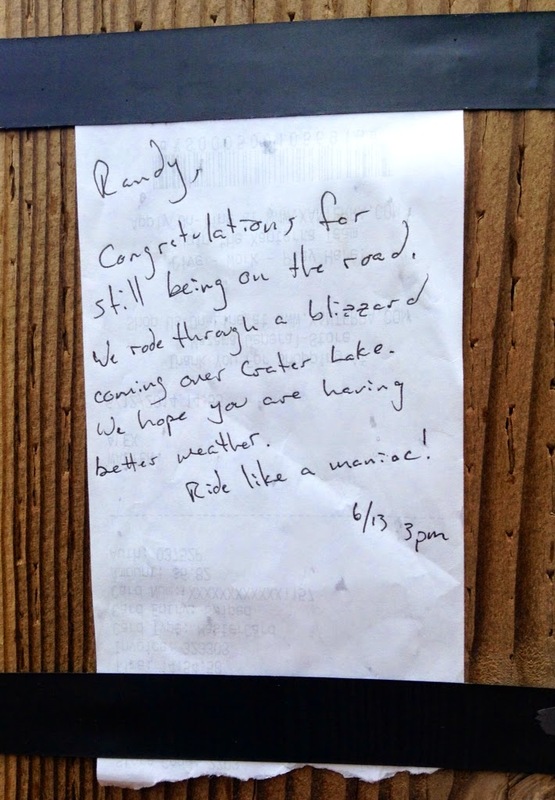 Our note for Randy, left at Cascade Summit. After dropping nearly 3,000 ft, the weather had warmed enough that we could shed some layers. 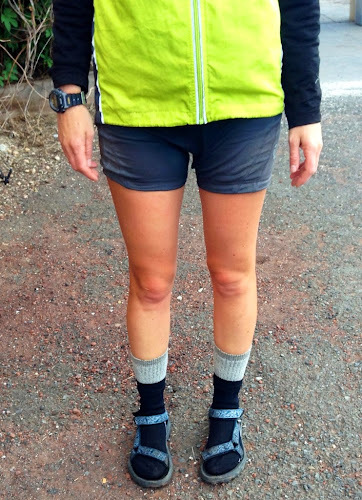 I took off my raingear, but I kept wearing my two layers of socks, as my toes were still numb from the wet and the cold. Alex told me that my black socks, sandals, and shorts reminded him of an old man dressed for a visit to the grocery store. Yeah, okay, maybe this wasn't exactly fashionable, but I was comfortable, and that's all I cared about. Caught by the fashion police. We checked into a motel in Chemult, where we took warm showers and used the heater to dry our wet gear. Alex was able to connect to the wifi at the motel, but I was unable to connect. Posting my blog entries from the last few days will have to wait for another day! I came out of crater lake blizzard today as well and got to the summit sign about 1 1/2 hour after you. Where are you? Woohoo! Randy wasn't too far behind us! As it turns out, Randy was spending the night in a hotel about 10 miles away. After exchanging a few texts with Randy, we decided that we'd meet up at our motel in Chemult tomorrow morning at 9:30am. We're so excited to see Randy again! What a crazy day! It came as no surprise when Alex informed me that today was Friday the 13th. 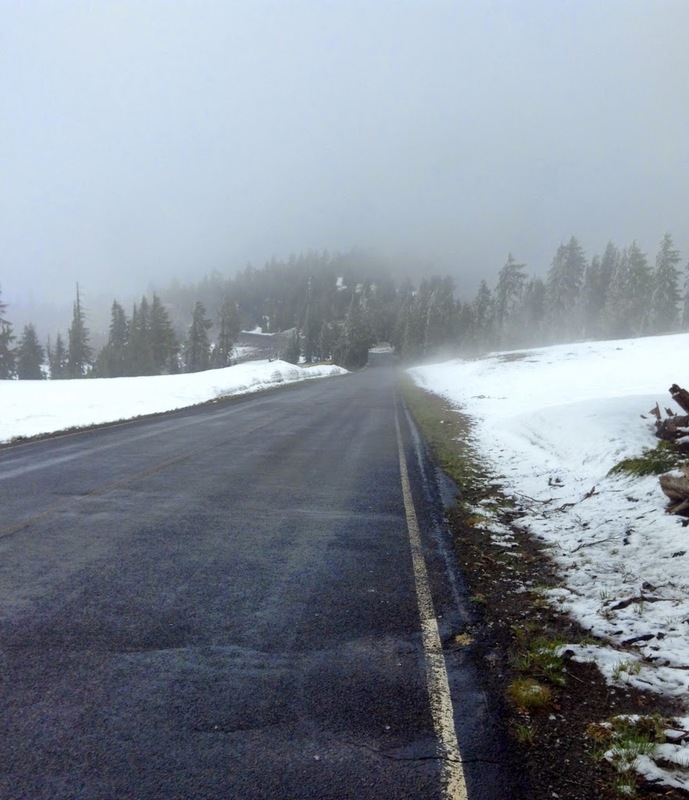 It was snowing like crazy when we passed the rim at the crater lake. I was worried about you guys. Glad that you made it through safely. Socks and sandals are perfectly ok for any occasion! Your blessing means a ton to me! Glad to hear that there's someone else who puts function above fashion!